Luxury city living at its finest! Everything you could want and more in a great cozy space! Guests rave about how well stocked our properties are... we provide robes, hair dryer, iron, washer/dryer, spices, laundry, snacks and many more! Located in the heart of historic Federal Hill, this home was built in the late 1800's. It has been modernized over the years while retaining its historic charm- all of the interior exposed brick is original. Steps away from Cross Street Market and just minutes away from the Inner Harbor, Stadiums and Convention Center, this airy two bedroom row home is the perfect place for your next stay! Perfect for 5 people (we can fit 6 if needed) in our two bedrooms and sleeper sofa. Each floor has sleeping spaces, so guests can have a little privacy on their own level, despite the cozy size. 10-20 min walk, $5 Uber ride or Baltimore's Free Public Circulator Bus gets you to MANY restaurants and bars, the Convention Center, Orioles and Ravens Stadiums, the Inner Harbor, Downtown and many more without needing a car! One area parking pass is available for guests which allows them to park on the street by the house beyond the 2 hour limit. (see house manual for more details) The West Street Garage is conveniently located one block away for additional cars. Enter through front door into open concept living room and kitchen. This updated space has a butcher block island that can open to seat 4 persons- 4 metal stools provided. Range stove, refrigerator, tiled backsplash, microwave, coffee maker, toaster, blender, dishwasher, and all the amenities make this kitchen the perfect place for your meals. Dishes, silverware, glasses, as assortment of cookware, spices, and other cooking necessities provided. Queen sized leather sleeper sofa (opens to sleep 1 or 2), two comfy chairs and a leather storage ottoman (stores bedding for the sofa bed) doubles as coffee table or additional seating. Large screen Smart (internet) TV and dvd player are perfect for catching the game or a movie on Netflix . Antenna provides access to 15+ local stations for tv's on each floor. You won't even miss having cable since Netflix and Hulu accounts are saved, so you won't need your own! First Floor Bath With Rain Fall Shower Head! Both 1st and 2nd floor bathrooms have cotton balls and cotton swabs/q-tips, shampoo, conditioner, and soap dispensers-- and brand new rainfall shower heads. Large medicine cabinet offers space to unpack. Guests rave about the shower and water pressure. The first floor bath can be shared by guests who stay in lower level bedroom and on the sleeper sofa in the living room. Second Floor Master Bedroom with Ensuite Bathroom! Walk up the open concept stairs to the loft style master. Open and airy with vaulted ceilings, exposed brick and comfy carpet, this beautifully furnished bedroom is your oasis from the city. Queen bed with luxury linens sleeps 2- with matching night stands. Luggage rack, closet and Smart TV, along with a desk and leather chair ensure you have everything you could want. Tiled Master Bathroom- Everything You Could Want! Accessed through the master bedroom on the second floor, this full bath is the perfect place to unwind with a tub/shower combo, toilet and sink. Rainfall shower head, and soap dispensers ensure your comfort. Purple bench in window nook outside bathroom is cozy place to relax- or wait your turn. Two twin beds, natural light from the one exterior window, its own television, closet and luggage rack. Guests share a night stand -- and would use the bathroom on the 1st floor. This cozy space is best for smaller stature guests, since the ceiling is a bit lower than the rest of the house. Private Fenced Backyard - Outdoor Oasis! Walk out through the laundry room in the back of the lower level, past the full sized washer and dryer (available for guests's use) and up a small flight of stairs to the private patio space with brand new fencing- small table, chairs, and an umbrella are provided in the warmer months. The entire house is yours to use and enjoy! Federal Hill - Registered on the National Register of Historic Places! An extremely popular neighborhood in Baltimore due to its rich history and exciting pubs and restaurants. With excellent proximity to everything that is Baltimore, the house is a 10-20 minute walk to all of the action of the Inner Harbor (water taxi, National Aquarium, Science Center), to the nearby Camden Yards and Ravens Stadium, and The Convention Center. Easy access to plenty of public transportation. The free circulator stops a few blocks away, and the light rail can be caught to DC or elsewhere just a few minutes walk from Camden Yards. The water taxi, public buses, Uber and Taxis are affordable ways to get to and from the house. One (1) parking pass available to park on the street near the house for free beyond the 2 hour limit/overnight. A refundable $75 deposit is required for use of the parking permit during your stay. Note: We have security cameras at the front and back doors for the safety of our guests and the property. The West Street garage is conveniently located at the end of our block and offers parking for an affordable daily rate- if needed for a 2nd or there are no street spots nearby. Thank you for choosing us and we hope you enjoy your time here. I have always been the host with the most. I have hosted family, friends and friends of friends in my home for many years. I have always loved having visitors and now welcome the opportunity to meet many new people from around the country and the globe. Here in my home in Bolton Hill, I have hosted short term guests for the last 5 years. It has offered me the chance to combine my love of meeting new people and hosting. I never knew what an amazing experience it would be. I have made friends across the world with some of my amazing guests. After many years of experiencing hospitality around the world, I have brought home some of the best ideas from other amazing hosts and hotels to share with my guests. But if there is anything I've missed, please let me know. I am always happy to improve upon the guest experience! I have loved hosting so much, that I have expanded to include a second property with my partner (in life and business) Aaron. And hope to do more in the future. Having guests in my home is a great way to meet new people, hear their story and share my love for this fascinating City I have adopted as my home. I am slowly exploring the globe, one corner at a time and love that VRBO lets me do that! When I can't travel, getting to meet people from other countries and learn about their world from the comfort of my own home is pretty great. Learning about their lives, food and culture-- and sharing mine is what makes the home sharing experience so unique. While I love to visit the mountains, the beach, the country, I am a City Girl at heart. I love the sights, tastes and sounds of Charm City and welcome the opportunity to share some of my fave things with you! Need some restaurant or entertainment suggestions- I'm your girl! While my day job is to help people, I volunteer with and support a few different animal rescue groups in Baltimore City. And express my love of gardening as the co-president of my local Garden Club. This house is the perfect vacation rental property! It is right in the heart of federal hill... just steps away from all the best Baltimore has to offer-- from our Inner Harbor to the Stadiums which house our Baltimore Ravens Football Team and Orioles Baseball Team. You couldn't ask for a better location- or a better house. This house was renovated and designed from top to bottom with guests comfort in mind. I hope you will love you staying here with me as much as I have loved getting it ready for you! Both bathrooms have new rainfall shower heads. Guests rave about the water pressure! Soap, shampoo & conditioner dispensers, cotton balls, Q tips-- and everything you could need! All new towels and linens are provided! Hair dryer, iron and ironing board, toothpaste. You name it-- we have it! Master math on 2nd floor has beautiful exposed brick, tile floors and walls and solid surface flooring with a tub/shower combo. 1st floor bath has tiled floors and shower stall, sink and toilet. Both bathrooms have windows that open. central heat and in wall heaters keep space warm in winter. High quality linens provided for the registered number of guests. All beds are made up with 2 pillows and 2 blankets. Extra blankets in the closet. Garage parking available down the street for an hourly or nightly fee. Check out the West Street Garage for more info! High quality linens provided for the registered umber of guests. Stocked with spices, bakeware, cookware and more! Small table and chairs are available in warmer months. Umbrella, too! Everything you could possibly need during your stay was there. Neat and clean they thought of everything to make you feel at home. Definitely will come back and stay here again. It was a pleasure hosting you and we would love to see you back on a future visit! 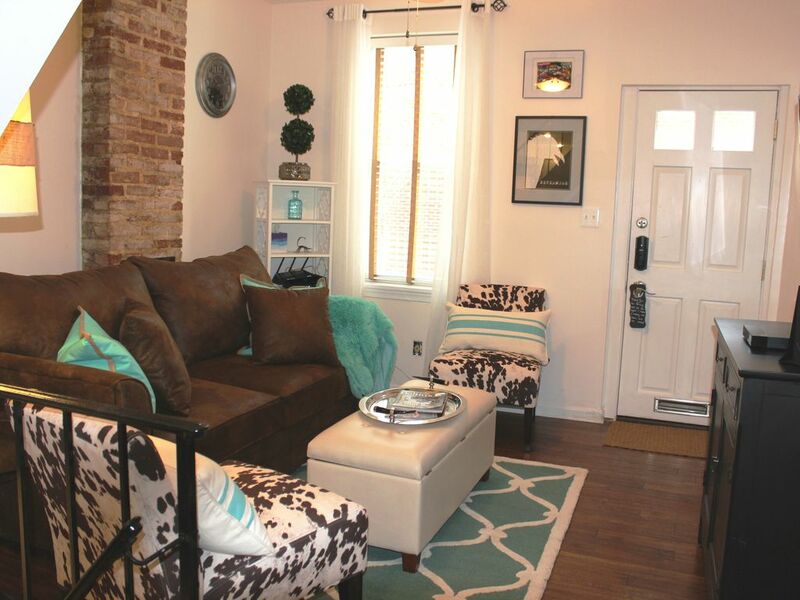 Cozy 2 bedroom townhouse ( but larger than appears in photos )in the heart of Fed Hill . Much larger than appears in photos literally steps away from the hottest spots in B'more Great hostess ! Please treat this home in a manner that would make your mother proud. Need something? Break something? Let us know ASAP. Exterior security cameras in front & rear ensures safety of guests by recording all traffic in and out of house. No unregistered guests are allowed in the house without prior permission. ALL guests must provide registration info prior to check in and your reservation should reflect the actual number of human beings who will be staying to ensure you have enough snacks, coffee, tea, towels and linens necessary. We aim to keep this house clean and bug-free for all guests! Please no luggage on any of the beds or furniture- only on the floor or on the silver luggage racks. If any of these activities take place on the premises or serious violation of the other rules, all guests will be asked to vacate immediately with no refund: *Pets or additional unregistered guests *parties/gatherings *binge drinking *smoking, candles or open flames anywhere *illegal activity of any kind Please help us conserve energy and stay safe by: *Keeping front and back doors closed and locked at all times *Closing the windows when you leave the house *Turning off all heaters and lights when not in use *keeping the temperature around 70 degrees *Not letting anyone other than registered guests into the house prior permission Thank you for leaving putting CLOSED bags of trash in the silver trash can in the backyard and making sure the cover is on tightly. Contact us immediately: *Water leaks or plumbing problems *Electrical issues *smoke, smoke alarms or CO2 detectors Check out: Leave parking pass on the kitchen counter & send confirmation text. If not, your $75 deposit will not be returned & $250 is deducted from security deposit. Thank you for *Leaving wet/used towels and robes in bathroom NOT on beds *Notifying us of anything broken or needing repair/replacement *Dirty dishes in kitchen *Cleaning up any large spills that might attract bugs. Thanks!